This crazy amazing weather has got me all grill happy! ok, i’ll be honest, the number of meals i have made in the past 2 weeks has been pitiful…i can’t openly say the number. i just can’t. Me and our schedule are so on the outs. But this past weekend, we got together with family to celebrate my niece’s birthday (birthday hugs, Jada!) and had ourselves a grillin’ meal. I wanted to add a salad that wasn’t traditional..so cyber-trolling i went. I love the Sprouted Kitchen website..if you haven’t visited, really..do yourself a favor and go on over! The photos are glorious..the recent pics from a vacation to Europe are frame-worthy, and Sara’s recipes are equally as beautiful. If you love veggies, clean cooking, natural ingredients, and incorporating seasonal foods into your kitchen, you will be bookmarking this site. STAT. Her love of eating food in it’s purest form makes this farmer’s wife happy (did i just call myself a farmer’s wife?? i guess he is so i guess i am..eeks!)! The Pasilla Chile and Lime Cabbage Slaw (click here for the recipe) was an incredibly tasty addition to our birthday meal and i have a feeling i’ll be making it often this summer! 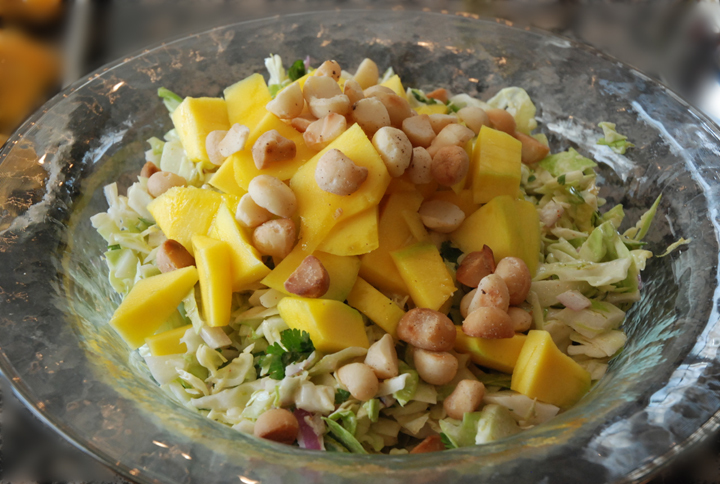 The addition of toasted macadamia nuts and fresh mango add the perfect texture and flavour. Mango just happens to be one of my favorite fruits. I also like that it can be made with greek yogurt versus mayo. I think it gives a lighter feel to it, and though there is still fat in greek yogurt, it is a healthier choice. 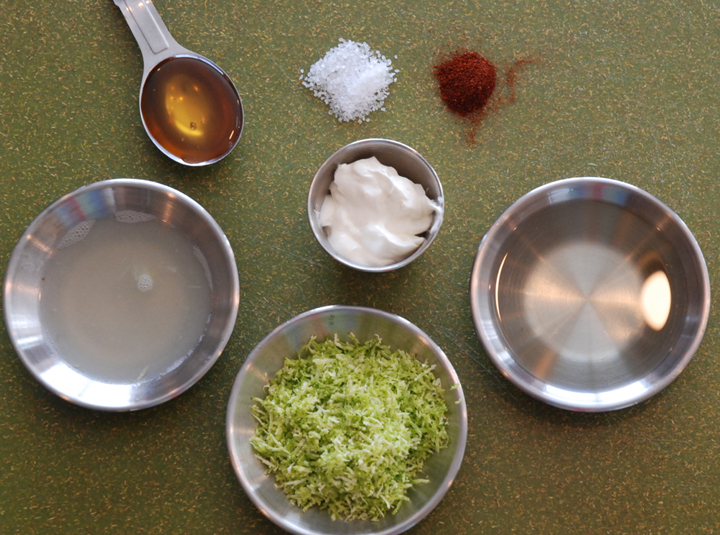 The addition of lime zest and juice lends a truly fresh flavour to this slaw. The ancho chile powder gives it a little kick. Additional ingredients include honey, sea salt, olive oil, and greek yogurt. 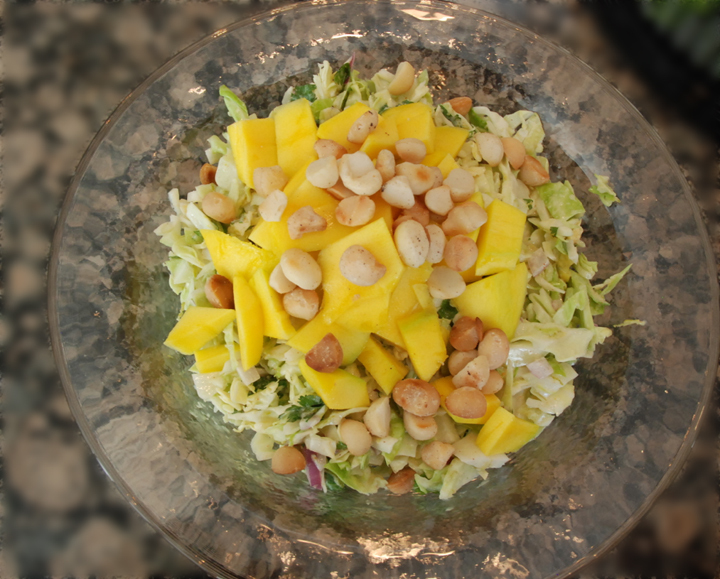 Thinly sliced green cabbage, mixed with fresh chopped cilantro and finely diced red onion compose the salad. Mix it together and let it rest for at least 15 minutes for all that awesome flavour to blend. Make this a complete meal, by adding some grilled meat, chicken or prawns. Delish! « Celebrating the Two Moms in My Life!